Here you have the facts, thought they might be uncomfortable—in my family, we have too many talents. If you know us, you know it's true. We're not your ordinary family of six girls with a kid here and a husband there. Anyone can be that. But we are more. We are sisters with game. And today it's Whitney's game that will make you wish you were one of us six. See . . .
. . . Whit had a dream. It was a dream deeply rooted in the American dream. She had a dream that her recipes would one day rise up and live out the fullest of their potential—to exist in a print book—for not all recipes are created equal. 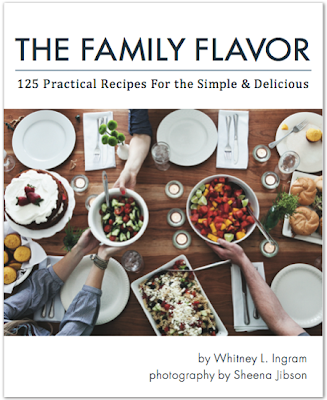 She had a dream that one day in the Rocky Mountains of Utah and the red hills of Georgia, sons of mothers and daughters of fathers would be able to sit down at the family table and enjoy badass recipes that she wrote. She had a dream that even the state of Nevada, where her cooking-defunct older sister lives, would be transformed into an oasis of flavor and spice . . . Okay, enough with my bastardization of Dr. King's speech. Let's just say that years ago the little sister wrote a food blog, and from there came a dream—she wanted to write a cookbook. Sister Whit knew her food was good enough. And Sheena knew it too. Sheena is a photographer, and not your average "Hey! I got a camera with switchy-out lenses! Let me shoot your wedding!" photographer. She is bonafide. Sheena told Whit that if ever she decided to write a cookbook, Sheena wanted to shoot it. They collaborated. They did it beautifully. And a few years after the dream's conception, a baby has been born. It's presently on sale for half-off. I bought five copies. I won't encourage you to do the same. Just one should be sufficient. I bought three. So freaking excited to get them in my grubby little hands. I bought one! I love that you bought five. I'm crazy excited for Whitney. She deserves good things. They say pride is a bad thing, but I will ride it this time anyway. I do have six crazy talented daughters. So many diverse talents. The dad is even a creative businessman, and I have some in my pocket as well. We are a Family Force to be reckoned with. But, as Megan as clearly stated, this is Whitney's time to shine, and shine she does. We are so dang proud of this chix and her cookbook! It's an accomplishment!